We have a physical location in Claypool, Indiana. Contact us to stop by and pick up anything you need or would like to see. We DO NOT have regular store hours! Please call if you would like more information. So, who are "WE" anyway? Bev graduated from Central Michigan University with a Master's Degree in Park's and Recreation in 1974 and worked in that field on and off, married, and raised her two children. 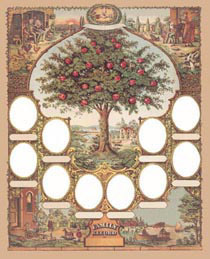 One day in 1996, Bev went to an antique show and found the original and beautiful 1888 Family Tree Photo Holder. It sat on her counter for nearly 2 years. The day came to "add the family photos" and it was unwrapped to find it in poor condition, crumbling from the acids in the paper - totally unusable! Friends encouraged her to have it reproduced and promised to buy one, so it was printed. That was the start of Petersen Reproductions. In February, 2002, the name was changed to Fun Stuff for Genealogists, Inc and it was incorporated in the state of Indiana. Bev has continued her education by taking classes at Indiana Vocational Technical College (IVY Tech) in South Bend, IN in graphic design and carries a 3.9 grade point average. Too bad she could not do that when in college as a "kid"! She is past president of the South Bend Area Genealogical Society in South Bend and has taught genealogy for six years at Indiana University at South Bend. Genealogy remains number one on her list of hobbies and creating new and useful things for the genealogist is her passion. She gladly will consider your requests so please e-mail Bev with your ideas. Bev attends all national genealogy seminars and many state and regional events. If you are in the Great Lakes region, please contact Bev if you would like to have her attend one of your society seminars as a vendor. Discounts to stores and genealogy societies are offered so please ask! Watch for much more to come!